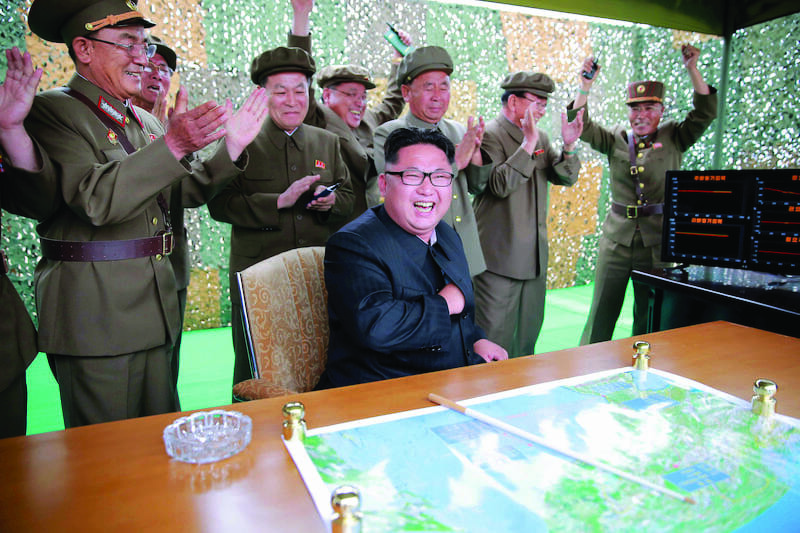 Home Community Global North Korea Says Seeking Military “Equilibrium” With U.S.
North Korea Says Seeking Military “Equilibrium” With U.S.
North Korea has launched dozens of missiles under Kim’s leadership as it accelerates a weapons program designed to give it the ability to target the United States with a powerful, nuclear- tipped missile. 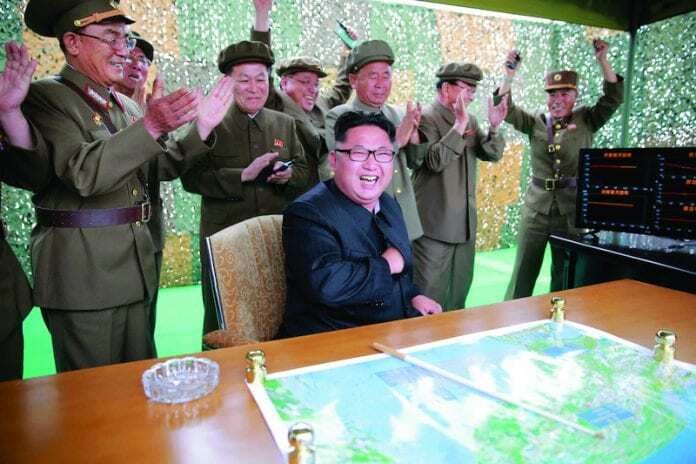 SEOUL/UNITED NATIONS, (Reuters) — North Korea said recently it aims to reach an “equilibrium” of military force with the United States, which earlier signaled its patience for diplomacy is wearing thin after Pyongyang fired a missile over Japan for the second time in under a month. “Our final goal is to establish the equilibrium of real force with the U.S. and make the U.S. rulers dare not talk about military option,” North Korean leader Kim Jong Un was quoted as saying by the state news agency, KCNA. After the latest missile launch, White House National Security Adviser H.R. McMaster said the United States was fast running out of patience with North Korea’s missile and nuclear programs. “We’ve been kicking the can down the road, and we’re out of road,” McMaster told reporters, referring to Pyongyang’s repeated missile tests in defiance of international pressure. “For those … who have been commenting on a lack of a military option, there is a military option,” he said, adding that it would not be the Trump administration’s preferred choice. Also on Friday, the U.N. Security Council condemned the “highly provocative” missile launch by North Korea. It had already stepped up sanctions against North Korea in response to a nuclear bomb test on Sept. 3, imposing a ban on North Korea’s textile exports and capping its imports of crude oil. The U.S. ambassador to the United Nations, Nikki Haley, echoed McMaster’s strong rhetoric, even as she said Washington’s preferred resolution to the crisis is through diplomacy and sanctions. “What we are seeing is, they are continuing to be provocative, they are continuing to be reckless and at that point there’s not a whole lot the Security Council is going to be able to do from here, when you’ve cut 90 percent of the trade and 30 percent of the oil,” Haley said. North Korea’s latest test missile flew over Hokkaido in northern Japan and landed in the Pacific about 2,000 km (1,240 miles) to the east, the Japanese government said. It traveled about 3,700 km (2,300 miles) in total, according to South Korea’s military, far enough to reach the U.S. Pacific territory of Guam, which the North has threatened before. “The range of this test was sig- nificant since North Korea demonstrated that it could reach Guam with this missile,” the Union of Concerned Scientists advocacy group said in a statement. However, the accuracy of the missile, still at an early stage of development, was low, it said. Beijing has pushed back, urging Washington to do more to rein in North Korea. “Honestly, I think the United States should be doing .. much more than now, so that there’s real effective international coop- eration on this issue,” China’s ambassador to the United States, Cui Tiankai, said on Friday. “They should refrain from issuing more threats. They should do more to find effective ways to resume dialog and negotiation,” he said, while adding that China would never accept North Korea as a nuclear weapons state. North Korea staged its sixth and most powerful nuclear bomb test earlier this month and in July tested long-range intercontinental ballistic missiles capable of reaching at least parts of the U.S. mainland. Last month, North Korea fired an intermediate range missile that also flew over Hokkaido into the ocean. Warning announcements about the latest missile blared in parts of northern Japan, while many residents received alerts on their mobile phones or saw warnings on TV telling them to seek ref- uge. The U.S. military said it had detected a single intermediate range ballistic missile but it did not pose a threat to North America or Guam. Russia’s U.N. ambassador, Vassily Nebenzia, said the United States needed to begin talks with North Korea, something that Washington has so far ruled out. South Korean President Moon Jaein also said dialog with the North was impossible at this point. He ordered officials to analyze and prepare for possible new North Korean threats, including electromagnetic pulse and bio-chemical attacks. The United States and South Korea are technically still at war with North Korea because the 1950-53 Korean conflict ended with a truce and not a peace treaty. The North accuses the United States, which has 28,500 troops in South Korea, of plan- ning to invade and regularly threatens to destroy it and its Asian allies.